Imagine you are walking through a garden. Some areas are lush and filled with beautiful fruit. Then you take a few more steps and notice huge patches of dry ground where plants are bent over, withered, and brown. That dry patch will eventually produce dryness in the rest of the garden. 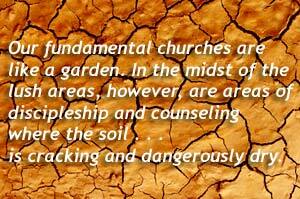 Our fundamental churches are like that garden. Wonderful aspects of our ministries are flourishing, and the perfectly green trees there give shade and encouragement. In the midst of the lush areas, however, are areas of discipleship and counseling where the soil of many of our fundamental churches is cracking and dangerously dry. 9 Marks interviews Christian Counselor Ed Welch on the topics of co-dependency, substance abuse groups like A.A., medicating depression, “integrationism,” “nouthetic” counseling, the role of counseling in the local church, and more. Note: Jason Janz asked Don Sands to write a personal testimony in regard to his brother passing away from AIDS. Thanks, Don, for your contribution. “Do you not know that the unrighteous will not inherit the kingdom of God? Do not be deceived. Neither fornicators, nor idolaters, nor adulterers, nor homosexuals, nor sodomites, nor thieves, nor covetous, nor drunkards, nor revilers, nor extortioners will inherit the kingdom of God” (1 Cor. 6:9-10, NKJV, emphasis added). I trust that those reading will see that my aim is to share the truth of the Gospel with the love of Christ and the power of the Holy Spirit to convict and convert sinners. Is there a problem in the Church with reaching out to homosexuals in our society? No doubt about that. The visible Church goes from one extreme to the other in proclaiming the Gospel to those who are homosexual. There are those who either totally disregard the clarity of Scripture pertaining to lifestyle as a sin. Then there are those who condemn this particular sin in a most condemning manner without exhibiting the love and grace of our Lord Jesus Christ. Both extremes have done tremendous harm for those who are genuine witnesses to the homosexual community. "The Christian life is to be a balanced life." Read more about "The Christian life is to be a balanced life." "God what is going on?" 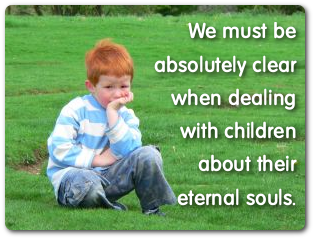 Read more about "God what is going on?"